A box of wine is portable, but not classy. Stemware is classy, but not portable. But in a stroke of mad genius, inventor James Nash has combined the two to revolutionize drinking on the go. Cheers! Meet the Tulip. 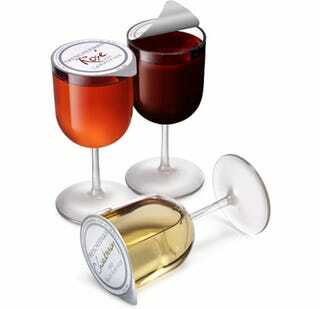 Nash's company, Wine Innovations, has been selling these babies like hotcakes at about $3.40 a glass. Which isn't bad for the quantity: each sealed, recyclable container holds 187.5ml (about six ounces) of vino. Just enough to convince yourself that you're not drinking a full glass, so might as well pop open another one.